I had meant to post a 25 projects post every other week all year long, with one extra week. But I got really behind on blogging and some personal goals when I stumbled across a prayed-for job, and put all my time into work and taking care of my family and home, and then we were out of town, first to Utah and then to Palm Springs. Whew! Finally, I was able to catch my breath and jump back on the blogging train (though I'm a few cars back from where I had hoped to be). 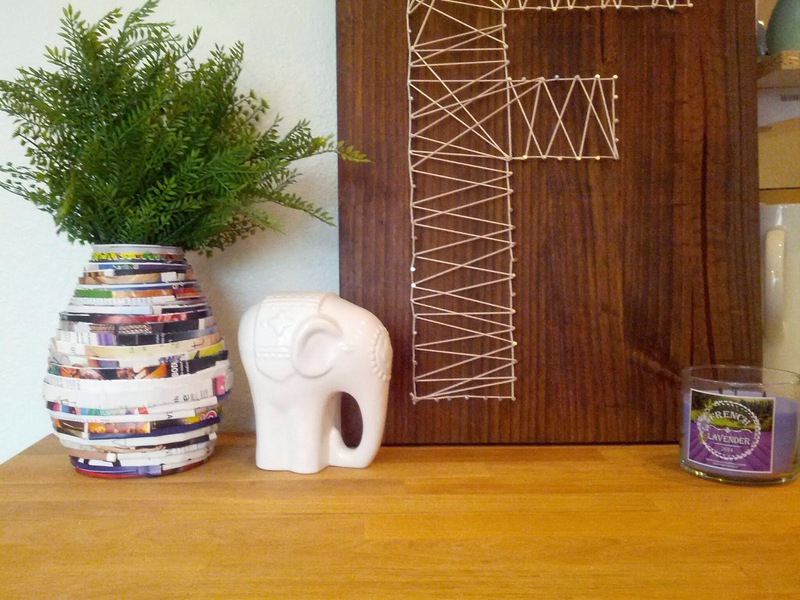 So here is number 7, probably the easiest little craft you could ever do: recycled magazine paper vase. A long time ago, I had wanted to make a sculpture (or bowl or vase) out of recycled paper spirals a la this pin on Pinterest. I had started a bunch of various sized spirals and made a bowl, but it was too flimsy and heavy at the same time. It wasn't strong enough to hold it's own weight, and it drooped and started to fall apart. War story of 25 projects. While I was still on the "stacked spirals" idea, I burned my finger really badly with the hot glue. It took my breath away for the rest of the night, and almost totally turned me off to the project entirely. That's partly why I decided I hated the method I was using and had to go another way. And I'm glad I did. My finger ended up blistering (I've never had a burn that blistered before), and I would have risked more burns by doing it the other way. Always be careful with hot glue! is the point. This is Project 7 in my 25 Projects challenge. I am attempting to complete 25 projects this year. Contact me if you are interested in sponsoring one of the projects or featuring an item on the blog Craft supplies, handmade items, and home decor are encouraged.